Riots. We are seeing them erupt throughout the Middle East everywhere we look: Tunisia, Algeria, Albania, Yemen, Jordan and of course, Egypt. And in the wings, drooling with horrific glee, Iran is pushing and prodding for a Muslim uprising to oust the enemies of Islam - primarily the US and Israel - using their Muslim Brotherhood henchmen and utilizing Hezbollah and Hamas. And Iran's chosen vessel for Egypt - Mohamed ElBaradei, who, until a day or two ago, was under house arrest. You remember ElBaradei right? He's the tool for the IAEA who kept giving blessings to Iran and their nuclear program. But I'm sure he's a good guy - he has a Nobel Peace Prize just like Obama does. Wait a minute... On second thought, I guess that designation is pretty much a joke currently. I'm also sure it is a huge coincidence that George Soros and ElBaradei both sit on the Board of trustees for the International Crisis Group. By all accounts, Mubarak is a vicious dictator who routinely uses torture and murder to achieve his goals. The brutal Egyptian police are the feared enforcers for Mubarak and now they have all but disappeared from the streets, leaving Egyptians to protect themselves from roving gangs and militant Muslims who were freed from the prisons by radical Islamists. He needs to go, but G-d forbid he is replaced by Islamofascists. Since the Muslim Brotherhood is approximately 20% of the rioters and the Coptic Christians are about 20%, there is hope for a free government to be put in place. But much is in doubt. Let us return to the beginning of the riots. I have seen many who are asking who started all this in Egypt, including Walid Phares on Fox News last night. That's a very good question. And Phares stated that he believed it was bloggers on Facebook who began the riots. Curious, I started to dig and I believe he has stumbled upon something. In April of 2010, a weekly magazine aiming to link Arab bloggers with politicians, the elderly and the elite was launched in Egypt. The weekly Wasla - or "The Link" - is being heralded as a first for the Arab world, with plans for articles by bloggers as a way of giving them a wider readership. I understand that only 50 issues were planned. Sounds like just enough to accomplish an intended goal. 1,000 copies are planned for distribution to political, academic and literary circles. Wasla is published by the Arabic Network for Human Rights Information and financially supported by the Open Society Institute created by none other than George Soros. That wasn't very long ago and Soros has a definite track record of rallying the youth to create chaos and revolt. This is a link between Soros and Egypt and the other riots as well. Of course, he is several levels removed as he always is, but this has his telltale stamp on it as well as his documented financial support. If bloggers on Facebook started the riots, Wasla and ANHRI could well be involved. I don't read Egyptian or Arabic so I cannot know for certain. But I do know this, Soros always cloaks the implementation of revolutions in human rights. The names of his front groups are always misleading and usually state the opposite of what he does. Get it now? Not good. Read Morrissey's post all the way through. We seem to be in complete agreement on this issue and besides he's one hell of a writer and there are a lot more pieces in this puzzle than you are seeing in the media. 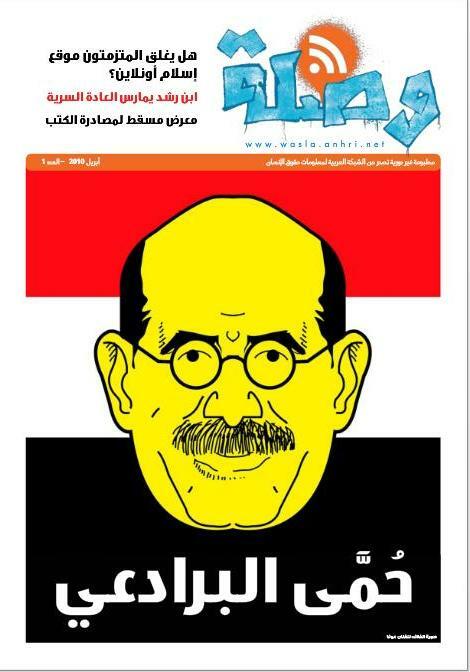 Right... More Jihadist propaganda from ElBaradei. Who would've thought? Step Four: Provoke an election crisis. You wait for an election and during the election, you cry voter fraud. Step Five: Take power. You stage massive demonstrations, civil disobedience, sit-ins, general strikes and you encourage activism. You promote voter fraud and tell followers what to do through your radio and television stations. Incitement and violence are conducted at this stage. Sounds eerily similar to the riots in Egypt currently doesn't it? 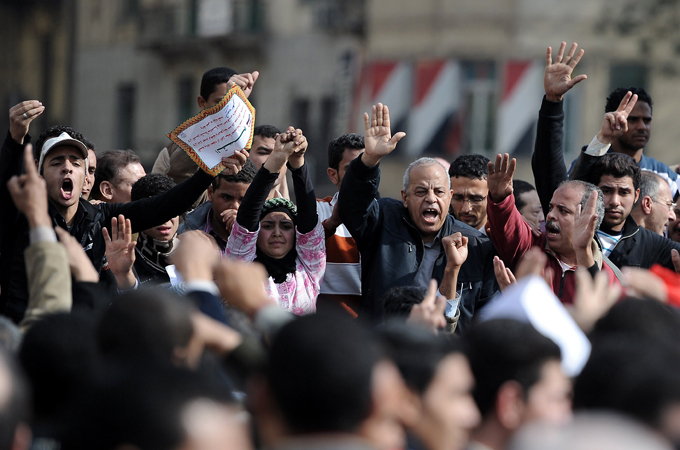 Do you think it is possible that Mubarak shut down the Internet to stop the bloggers from continuing the riots? That I don't know, but it is a possibility. Doesn't make it okay by any means, but it does show a level of desperation and a knowledge of who was behind the original flash point. Once again, a country is devolving into violence and revolution. Only this time it is spreading throughout the Middle East and it could have deadly consequences for Israel and the US. Many of the people in Egypt are starving or hungry. Inflation and food prices are going through the roof. They can't find jobs. When people get hungry and desperate, all bets are off. You will always find the likes of anarchists, communists, Marxists (CodePink is now in Egypt) and of course George Soros, just waiting to offer their help; waiting for that perfect moment to make their move to create chaos so they can grab more power and more wealth. It may be that the monster Soros is rockin' the Casbah right now and it is getting ready to explode. This writer seems concerned about Mubarak being a dictator in a country filled with Muslims. He even said it was "not okay" for Mubarak to shut down the internet to stop the "revolution". Why are we all so afraid of spilling blood if it is for the benefit of our own people? Our goals ought to be realistic, and a world full of pretty flowers and freedom for all is not realistic. It is either Mubarak or some socialist-Muslim who will make our lives more difficult at this point. In a better world, we'd covertly encourage Mubarak to be "bold, bloody and resolute", and cleanse his country (with bullets) all these communists/islamists in one swoop - especially that communist stooge ElBaradei. Then, after all the blood is spilled, we'd "intervene" militarily, topple Mubarak, and put together a puppet regime full of "freedom" to appease the Utopians. That's the evil "Imperialist" U.S. I wish we were. Unfortunately for us, and for the whole world, we aren't even close. We're ruled by people who cannot even rule themselves, who think in unrealistic ways. It's a real head-scratcher trying to figure out why the Marxists/Socialists are being useful idiots for Islamic extremists. After all, they won't be useful for long in a post-Mubarak Egypt where there will probably be a Taliban or Iranian type government. What usually happens after a revolution is a provisional regime until that time when societal forces re-align themselves and the most powerful contender emerges. Should El Baradei become President, he will surely be just a transitional figure.